Like all Toastmasters both the clubs we visited were welcoming and friendly. The Mrs and I love Toastmasters and are already missing our home club. One of the goals we had for our trip was to visit Toastmasters clubs. We accomplished that twice while in Edinburgh. There are 3 public Toastmasters groups that meet in Edinburgh. This post will talk a little about they are different and the same as our home club based on our visits. The first thing that was obviously different was the clubs only meet every two weeks. The second thing was those meetings were 2 hours long, twice what our home club is. Interestingly they use basically the same format for their meetings, which means they still only have 3 speeches a meeting. That also means members’ progress is slower because there are half as many opportunities per year. Even though the meeting is longer, the speeches are still 4-6 minutes. Having a longer meeting does give them time for a break in the middle where everyone can talk and network. That was one of the most enjoyable parts of the meeting for me. If you were to just list the roles of the Scottish meetings and our Abilene meetings everything would almost match up exactly. The order is a bit different and some of the roles work considerably different, but basically it was what we would expect. The meeting is opened and closed by the Toastmaster not the President. There is no opening by the President and the Toastmaster isn’t introduced. (More on introductions in a minute). At one meeting the President did speak near the end, but that was to talk about some club business, not to close the meeting. Also there was no Pledge of Allegiance nor prayer/though. They did say the Humor Master (what we call the Joke Master) could be the Invocator. Table Topics was after the break, which put it after the speeches and the speeches evaluations. You are probably wondering what they do with all that extra time if the speeches aren’t any longer. In a word — Evaluation. There is a lot more evaluation. In our meeting each speaker has an evaluator, and the meeting has a general evaluator. 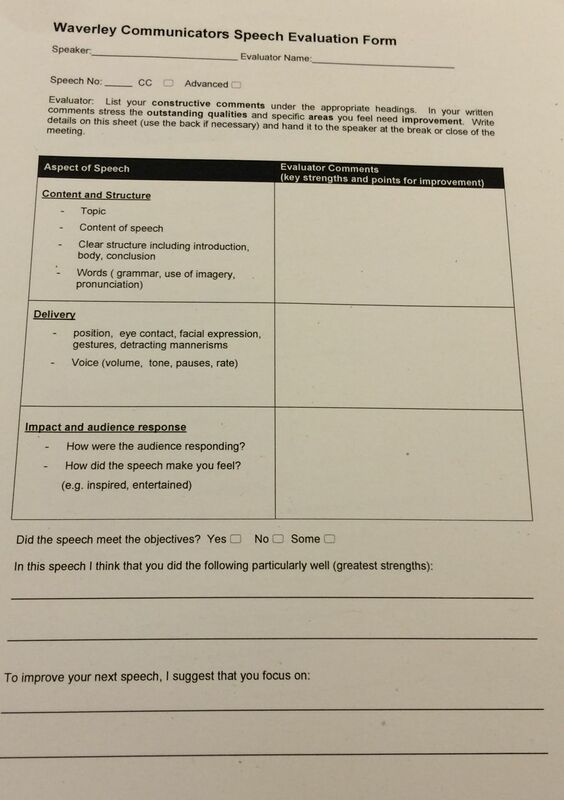 So does theirs, but they also give 2 minutes after each speech for everyone to write down thoughts on each speech. In every seat when you arrive there are three forms giving you a guide for evaluating. After you fill it out, which is optional, you write the person’s name on it and either hand it to them then or wait and give it to them at the break. None of the speakers read these at the meeting. So everyone evaluates the speakers, not just their evaluators. The Evaluators do still come to the podium and give a specific evaluation for the person, just like ours. (Well we mostly don’t go to the podium). The General Evaluator role is much more all encompassing. Basically they give an evaluation of not only the meetings, but each person who had a role in that meeting who hasn’t been evaluated by someone else. During every meeting, the timer, grammarian, ah-counter, each evaluator, etc all get specific feedback from the General Evaluator. Obviously this takes a little longer than our General Evaluator has, but it is valuable feedback. Both clubs had an Ah-Counter role separate from Grammarian.The Ah-Counter is the one with a buzzer, not the Timer. They are suppose to buzz non-speakers every time they use an Ah so they will become aware of them. Neither of the club’s AC’s were really good about this, but it is an interesting idea. If you don’t do it all the time, then when you do do it it throws the speaker off. I think if it was going off almost constantly, you’d just deal with it and go on. They did table topics a little different. There was still a Table Topics Master, whose job it was to lead the table topics and ask the questions. But they also had a Table Topics Evaluator, who came up after and gave feedback to each Table Topics Speaker and the Table Topics Master. The Table Topics Evaluator was also the one who gave out the Table Topics blue ribbon. Small brag time, The Mrs got Best Table Topics at the first meeting we went to and I got it at the second. The Table Topic question we got at the first meeting was hard. The TTM asked us during the break if we’d be willing to do Table Topics, so people did know it was coming. He even told us the general shape of the question. He said we’d be given the beginning of a story and we had to finish it. When I got asked, the story started something like this…. If found it very hard to jump right into the middle of a story like that. It is also hard to BS your way around it, like you can with many table topics questions. I also committed a bit of a faux pas at the first meeting. When they called on me, and I was first, I just stood up and did my Table Topic from where I was. Everyone else went to the front. The Evaluator mentioned that in my evaluation. At the second meeting there was no warning for us before the meeting. They just asked if one of the visiting Toastmasters would like to do a Table Topics question and I said yes. They didn’t have our fancy timing lights. Instead they used a notebook with colored pages in it. The timer would flip the page over to change the color. Same colors with the same meaning as our lights. One thing I did notice was that everyone was only given 30 seconds over, not just people past Competent Communicator. I also don’t think they asked how long the speech was. It was just assumed to be between 4 and 6 minutes. That’s actually probably a better way to do it. They also timed everything. Their agenda had times next to every role on the agenda, and the Timer and Toastmaster watched where they were during the meeting. During the Timer’s report he told each person how they didn’t on their time. This role was almost exactly like ours is. One club did use the title Word Master, which I thought quite a bit cooler. Neither club did introductions for either the speakers or anyone in any role. 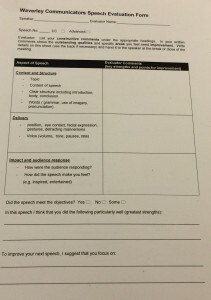 At the first meeting the General Evaluator mentioned the Toastmaster should have done bios. At the second meeting it wasn’t mentioned. At the second meeting they had some missing people, and one bit of juggling they had to do involved finding someone to “do CL”. I had no idea what that meant, but The Mrs sorted it out. Everyone who had a role and was completing their Competent Leader manual gave those manuals to this person. Then he filled the evaluations for all of them during the meeting. Would save you having to find someone to do yours like we do, but seems like quite a job for one person. Those are my observations about the differences and similarities between the Texan and Scottish Toastmasters meetings. The one thing I will say was very obviously the same were the people and their attitudes. Toastmasters are just friendly, open and ambitious people. They have the same hopes and fears. They are the kind of people who do something about it, even if sometimes it is difficult. We’ll try and get to some meetings while in London as well.